Earlier this year, the Kansas City Chiefs broke a streak of 34 years in which they did not draft a quarterback during the first round of the NFL draft, when they traded up to select Patrick Mahomes II as the No. 10 overall pick. Mahomes will now snap a streak that is even longer. The rookie signal caller will debut in the regular season for Kansas City when the Chiefs travel to Denver to face the AFC West rival Broncos Sunday in what otherwise is a meaningless game. However, the game will mark the first time since 1979 when Steve Fuller started that the Chiefs have started a rookie quarterback during a non-strike season. Mahomes said he is ready to play. He won the role as backup to veteran Alex Smith during the preseason but has not played since training camp. Kansas City, which is 9-6 and the AFC West champions, does not need to win Sunday’s game. They cannot improve or make their playoff position any worse than it is now, so it makes sense for the Chiefs’ head coach Andy Reid to rest some of his regulars and give a few new faces a chance to shine. The decision to play Mahomes has added intrigue to an otherwise boring game. Mahomes was the first signal caller drafted by Kansas City during the first round since 1983 when they picked Penn State’s Todd Blackledge. However, the decision to draft Mahomes was willing to be made by Reid due to looking toward the future as Smith is 33 and will either become too expensive, as his contract in 2018 becomes astronomical, or he will be too old to play the position effectively. Mahomes showed his rocket of an arm off during preseason, and his ability to find something out of almost nothing has brought him comparison to another protégé of Reid – Brett Favre. His mentality of a gunslinger is in stark contrast to that of Smith, whose has a habit of conservative decisions and check-downs that have led the team to four appearances in the playoffs in the five years he has played with them but failed to win the fan base over that prefers a high-octane, high scoring offense of years past. 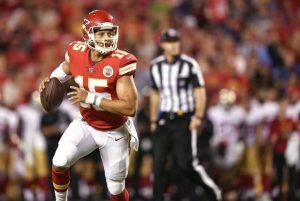 Smith agrees with giving Mahomes a chance on Sunday, and knows that he along with Chiefs coaches, players and fans might be watching a prelude to the future when the rookie takes the field.